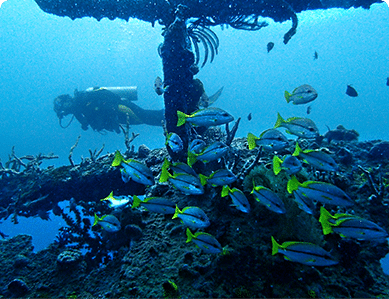 Diving sites Philippines, in itself, is a wonderful experience. You need a reliable guide that can showcase beauty and majesty of the marine wildlife to truly appreciate diving in the Philippines. Since 1985, Fun & Sun Dive Travel provides reliable and well maintained diving equipment, experienced and friendly dive guides as well as comfortable and fast boats to guarantee safe and enjoyable dives. Diving in Cebu, Mactan, Malapascua, and Coron has never been so much fun and exciting! Fun & Sun Mactan stands on Punta Engano side, just about 15 minutes drive from the airport. Along the coast line, stands several resorts such as BE Resort (we are right beside it), Moevenpick Hotel, Shangri la or Crimson to name a few, which are truly dream places to stay for a vacation. Read More..
From Cebu City, it will take you approximately 3 hour to reach the port of Maya from where you will take a banca boat for the last 30 minutes of your journey. Don’t hesitate to contact Fun & Sun team to provide you for any transfer assistance at [email protected] Read More..
Coron Island Palawan is a wedge-shaped limestone island, with few of its coastal areas being covered by mangrove forests. It has seven lakes, famous of which is the nationally-acclaimed cleanest lake in the Philippines, the Kayangan Lake. Read More..
On board one of Fun & Sun comfortable banca boat, you will feel part of a Diving Expedition in the Phillipines to some often remote location. The nights will be spent on land, in selected resorts or even on the beach or on our boat for the real adventurers (that is if you would like to experience camping at sea…). Read More..